Welcome to the home of the Dave Fultz Memorial Laboratory for Hydrodynamics. 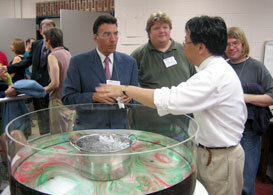 This laboratory is dedicated to the memories of the late Professor Dave Fultz, who pioneered many revealing fluid experiments concerning the atmospheres and oceans of rotating planets. It is intended primarily for instructional purposes for graduate and undergraduate courses. The construction of the laboratory was funded by the Fultz family, the University (Women's Board, Provost's Office, Physical Scienses Division, Center for Teaching and Learning), and NSF.